I’ve always dreamt of hairdresser’s where you get higher hair volume and thicker hair. The idea finally came up and that’s what we do till date. Find out more what are braids, dreadlocks, synthetic dreadlocks, fake dreadlocks, nubian twists, corn rows, crochet braids, hair extensions and how you can maintain these hairstyles. Have a look in different sections and gallery where you can see pictures of our creations. We’re based in Prague. Check our price list. You’ve entered website, where you will get essential information about hairstyles that let you enjoy long and thick hair as long as you want. These hair styles have their stable position among classic and extravagant hairstyles. Their advantage in general is their relative maintenance-freecompared to other hair styles, the feeling of voluminous and thick hair. You don’t have to think every day what to do with your hair and you don’t need to use your brush. Other advantage is that you can let your hair grow. You can choose how long you you’ll wear the hairstyle – we createtemporary ones lasting about a month to permanent ones lasting for years and it’s up to you how long you want. We are dedicated to afro hairstyle inspired creations from year 2000 and thanks to you and new trends we have always something new to learn. We like to fulfil your dreams and ideas you share with us. We take all of you individually and we try to materialize you wishes. We usually use artificial fibre Kanekalon for extensions as well as human hair for dreadlocks. Other materials for extension are available on request. We provide wide colour range of kanekalon. The braids or Nubian twists are technically made by adding bundle of artificial material to a lock of your hair which makes the braid or twist of desired thickness. We’ll agree first how thick they will be and we’ll discuss and find the way you want. When making braids, your hair is not tangled as the hair is in one direction. 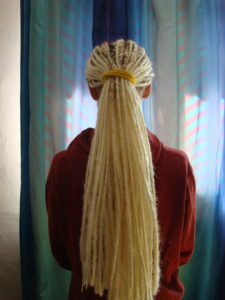 We usually make on whole head around between one hundred to two hundred braids. Your hair volume increases while your hair is not damaged. 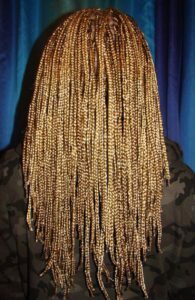 We also offer variation of senegalese twists called faux locks or cubanese locks within crochet braids. We make dreadlocks by systematically tangling the hair and making its surface smooth. There are several techniques of making dreadlocks, there is good or bad method, just the result matters – strong and lasting dreadlock on a good base. We assure you that we do not use any waxes, glues, burning and other obsolete methods, we use only mechanical power. The thickness of your dreads is usually among 0.5 cm to 1.5 cm. Usual count of dreadlocks on the head so that it looks really good starts from fifty. In order to tie your dreadlocks in a bun is necessary to have your hair long at least under shoulder. This is applicable for normal quality hair. If you have damaged hair, your dreads will be shorter. If your dreads just around the forehead are too short, we can extend so that you can tie them in a bun. Do you want long dreads after one day? Yes, it is possible. Just choose extended dreads. In order to have your extended dreadlocks done, you need to have your hair long at least 8 – 10 cm on the whole head. Extended dreadlocks have the same qualities like dreads made of just your hair. The advantage of Kanekalon extensions is their lightness and the capability of drying up fast. We can also use human hair for extension. The best about in extended dreads is the fact that you don’t have to wait for years to have long dreadlocks. 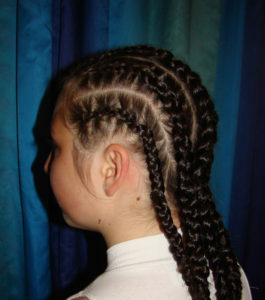 There are many types and patterns of corn rows. All of them are made by gradual adding of locks of hair that feed the thickening braid. Corn rows are either made of human hair or with the help of artificial material. Crochet braid hairstyles come from corn rows. Last trend in afro hairstyles are crochet braids. Their base is a corn rows on which are added readymade extensions of any type possible which makes this process shorter than regular braids, Senegalese twists, faux locks. Such a hairstyle duration is limited with the corn rows. It is possible to reuse the extensions. Synthetic dreadlocks are artificial, twisted and formed fiber that can be easily attached as well as removed without damage to your hair. Practically the same is applicable for fake dreads, they have structure looking like a real dreadlocks, but they are removable too. Among their types, choose smooth (not backcombed) and rough (backcombed) extesions. 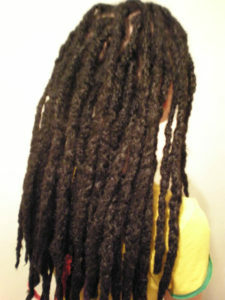 You can also choose between single-ended or double-ended dreadlocks which makes double count of dreadlocks on your head. There is a method based on the priciple of Crochet braids in which the extensions are attached to a thin braid made of your hair. The attachment is nearly invisible. 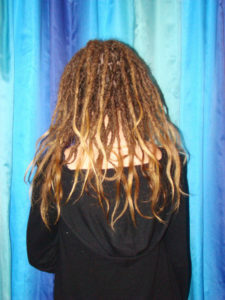 Synthetic dreadlocks with dreadlock texture extensions are called the fake or artificial dreadlocks. 50 – 80 pieces 4500 – 7500 CZK. Starting from 1500 CZK whole head. Dread 25-35 cm 70 CZK. Synthetic dreadlocks, fake dreads starting from 30 CZK piece.